Whip Aquafaba in the kitchen aid until white and creamy, then add lemon juice and half sugar. Whip for a few more minutes, then add the rest of the sugar. Beat mixture until it forms a stiff consistency. Use 2/3 of the mixture for meringues, put mixture into a piping bag and pipe 40 small meringues onto an oven tray lined with parchment paper. Cook meringues in the oven at the lowest heat for ½ hour (depending on the oven) then turn the oven off and leave the meringues for a further hour to dry out. Cook strawberries, Sugar and lemon juice in a pot until soft and stewed. Strain mixture into a bowl, discard the pulp then return to the boil, reduce by a third. Leave mixture to cool. When the fruit mixture has cooled, fold into the 1/3 of meringue mixture. 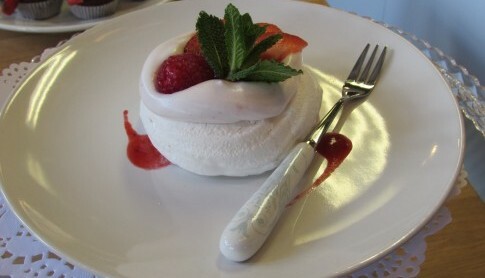 Pipe the mousse on top of finished meringues and top with fresh berries and couli.